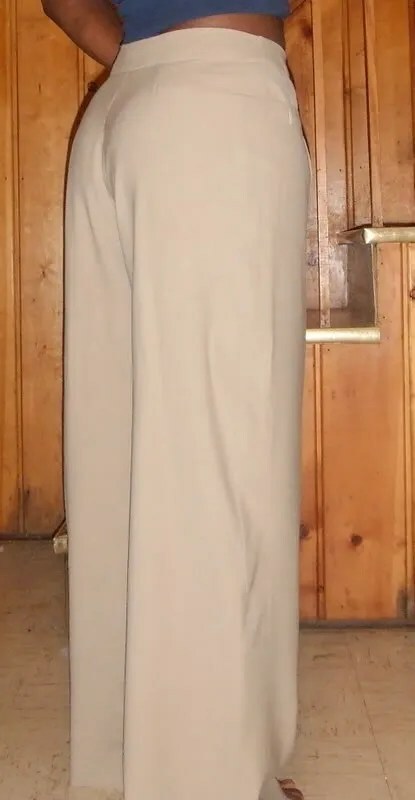 I realized yesterday while hemming my Burda World of Fashion 4-2002-122 trousers that I am essentially sewing a Chico’s travel wardrobe. This is the part where I should say that there isn’t anything wrong with Chicos — just not my style. But, there *is* something wrong with Chicos. I am first, 15 years shy of their demographic no matter how young a model they choose. Second, I’ve always thought their clothes were better suited for cruises. What’s odd though, is I’ve had two boyfriends buy me jewelry from Chicos as gifts. I remember the last time it happened my heart sank when I saw the big block lettered CHICOS on the box. I thought,”‘Crap. This relationship isn’t going to last. He doesn’t know me at all. What about my personal style says, ‘cruisewear’.” The earrings were just as ugly as I imagined them to be and we broke up a week later. Coincidence? I think not. I say I’m sewing a travel wardrobe from Chicos because everything I’ve picked is loose, not tailored and easy to wear / care for. That, IMHO, is Chico’s style. At least my stuff isn’t animal print. Don’t get me started on animal print. Which, I will say is just not my style. Animal print doesn’t personally offend my sensibilities. Except when black models are photographed in editorial fashion shoots wearing it. But, that is a Woman’s / African-American Studies paper on its own. I digress. 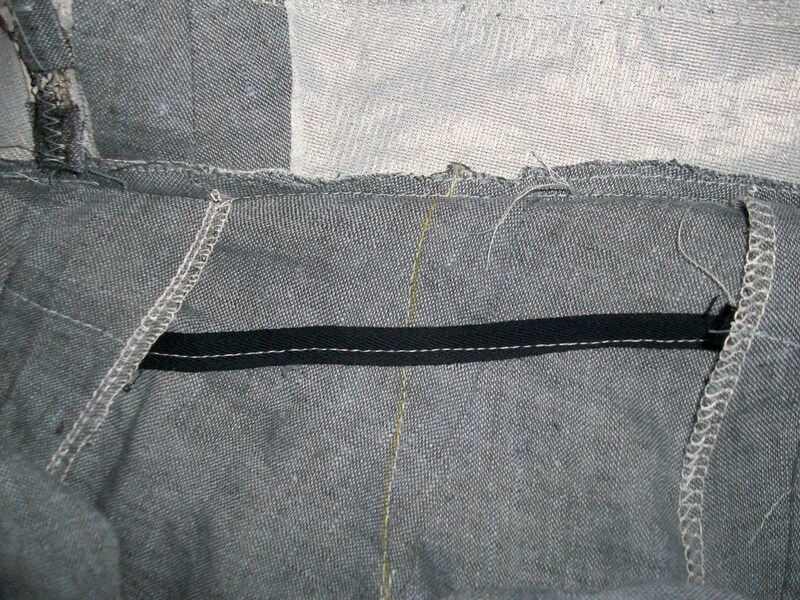 What I didn’t do, was interface the upper edge of the waistband and it stretched. And, it looks like another 1/2 inch more for my swayback would have been good. So, the waist line is kind of wonky especially in the front. But, trust. I will never wear something tucked in to these. If I wasn’t sucking in for this photo, then my pants wouldn’t have fallen, and you would see that the pants sit above my waistline. I will probably shorten these another half inch before I go to China. But, I’ll be wearing them with heels to work in the meantime. The pants are crazy wide! 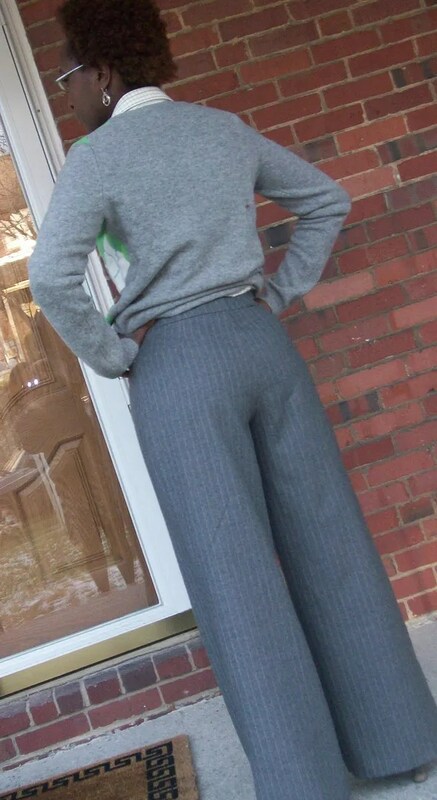 Power Sewing mentions that unless you are very tall you shouldn’t wear wide leg trousers. Oh, well. My driver’s license says I’m 5 ft 7 and I’m both calling that tall and sticking to that height. I suspect because they are so wide, that my protruding seat adjustment wasn’t critical. But, it worked well for my swayback. I’ll let you know tomorrow how the pants held up at the end of the day. Hopefully, they won’t have stretched out to my ankles! Can I Name My First Born ‘Cheviot’? 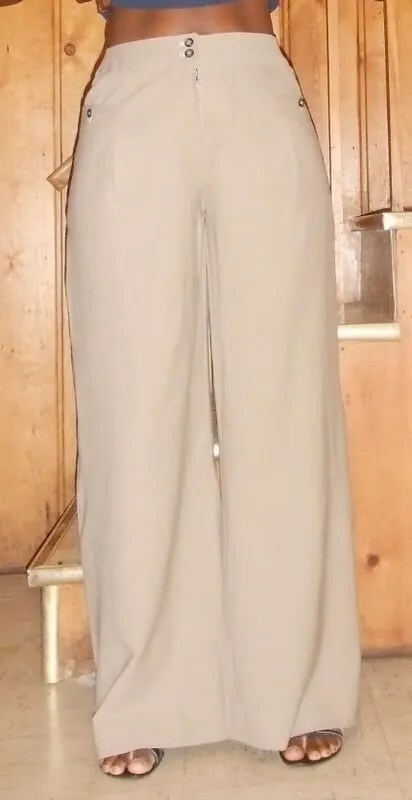 I am 100 percent in love with these pants!!! They are Burda 9-2007-115 and I first made them two years ago. Between the amazing fabric and finally getting the construction down, I honestly and truly love them. These pants are not fast nor are they easy. Iactually had them cut in this gorgeous cheviot wool from Egypt for over a year. 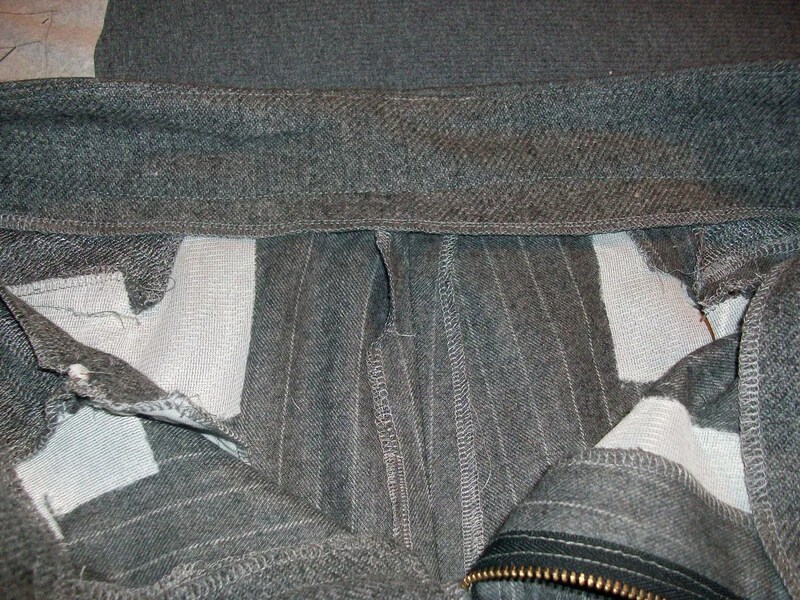 But, I was so disappointed with the jacket and just generally struggle with sewing pants that I put it away. And, I was actually going to throw it out in the “great sewing room move” but never got around to it. It’s really starting to get cold here and I am (as always) in DESPERATE need of pants / separates. I love the pockets. They are a thorn in my side to make, but I do just love them. 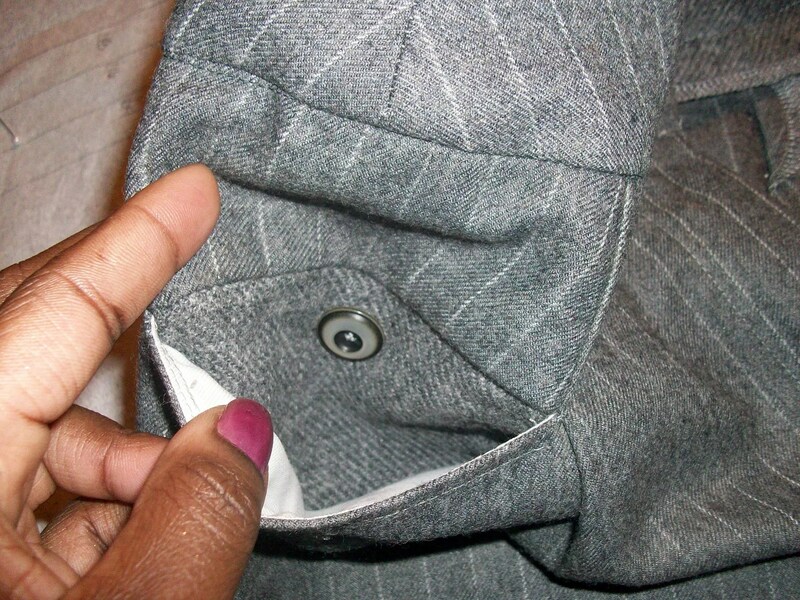 This time, I interfaced all the upper edges so that the pockets stayed crisp. 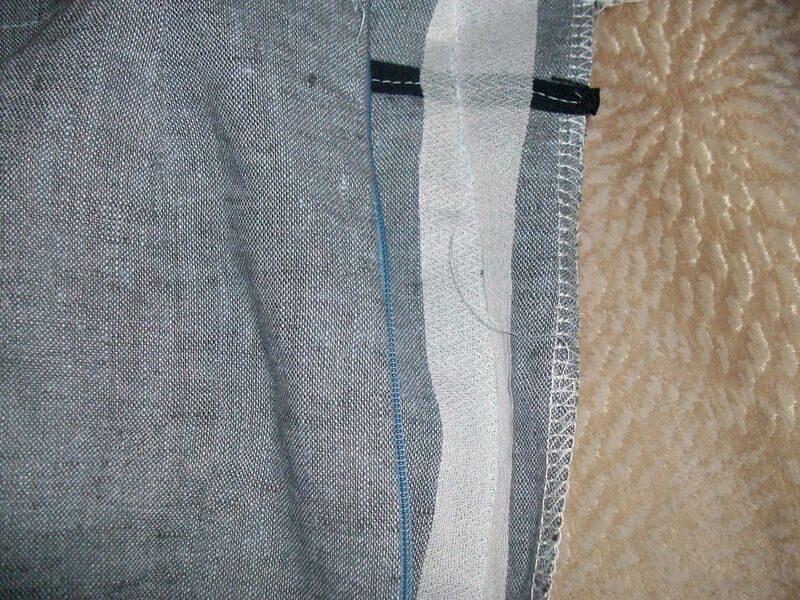 I also used pocketing in addition to the fashion fabric. And, lookit!! My fly front! Yes, I use the Sandra Betzina video. But, it’s always been hit or miss for me. This time, it worked (well, it worked after I ripped it out the first time). Now, I did leave the pants unlined. But, I am SO BAD at making pants that I figured I was better off focusing on the actual construction of these and getting comfortable with pants before I tackled the lining. Yes, I have fears of the knees bagging out. But, for now, I don’t care! The fabric is super firm and just deliciously soft. I would fly myself back to Egypt for more of this fabric. Truly. I will say, I have a desire to move away from wide leg pants. Burda says these are suited for ‘tall women’. I’m not short at 5’6. But, I ain’t tall. To qoute my mother, I don’t know that they are doing me any favors. The muslin Marji and I are working on is a slimmer cut but still needs some tweaking. In the meantime, I have ordered some fabric from Fabric.com to make at least two more of these this winter. Oh, this is pretty much what I want to wear all winter. Pants / skirt, sweater, shirt. I’m kind of into the three -piece wardrobe right now. When I worked at Lord and Taylor post college the rule was a dress, a suit or pants / skirt with a jacket. I think it’s a good rule of thumb for work attire. I am so stinking happy right now folks. I have clearly been in a slump. I think, well, I think that 2009 was just a lot harder for me than I was admitting to myself. I put on the ‘no one is going to ever love me so I might as well get fat’ 15 pounds — which does not make you want to sew (especially when family members think it’s ok to point it out to you. Like I don’t *know* that I’ve put on weight). Work has been just incredibly busy and painfully stressful. This left me not wanting to sew and not wanting to blog and honestly with little *time* to do either. But, making these pants — something I have just never done well and have little confidence in reminded me that I LOVE my craft. I LOVE to create and I LOVE to sew. 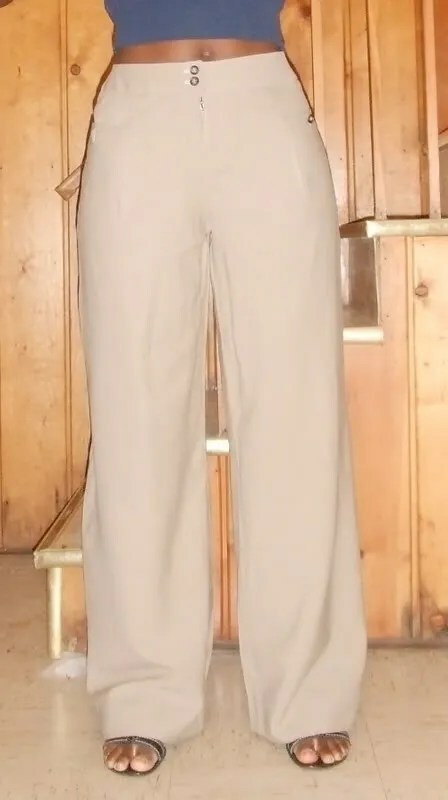 I was SO happy after these pants that I’ve already got my sweatshirt dress from La Mia Boutique cut and pinned. I’ve pulled skirt lengths for my next four projects. I’m happy and not stressed in my sewing room since Marji helped me straighten it out. I guess what I’m saying is I’m back baby, I’m back! Ahhhh. I can’t tell you the sense of relief of adding a new pair of pants to the wardrobe. I made these about three weeks ago, washed them twice and they’ve held up! These are Vogue 8457, view C (with pleats, no belt). They are made up in a silk herringbone I got from Fabric Mart last year, I think it was $10 a yard. They are fully lined with some Bemberg from Joann’s. Overall the pants were probably $30. They are super wide. Like I walk and feell the cuffs swinging about wide. 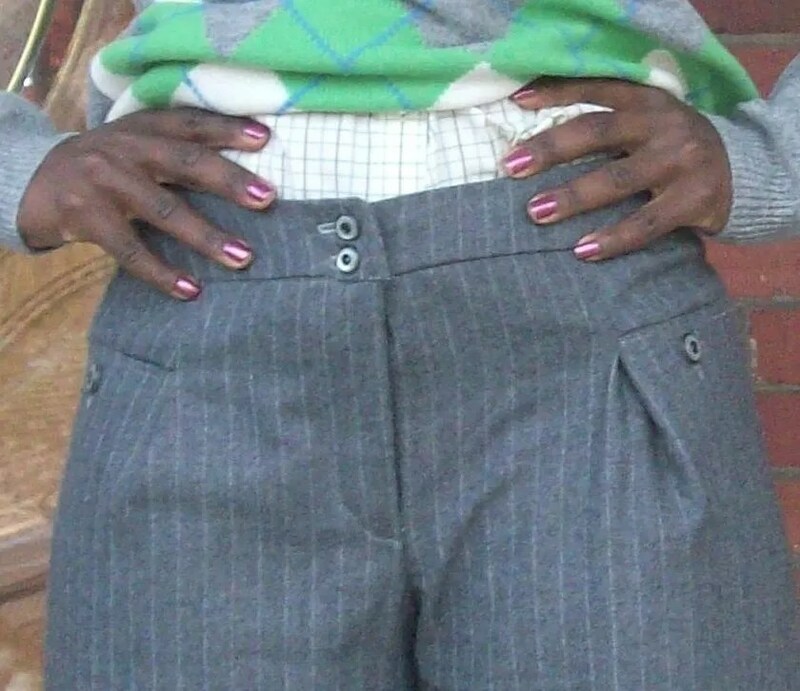 But, I like them because they hug my slim bits (hips and waist) and glide over my not so slim bits (rear and thighs). 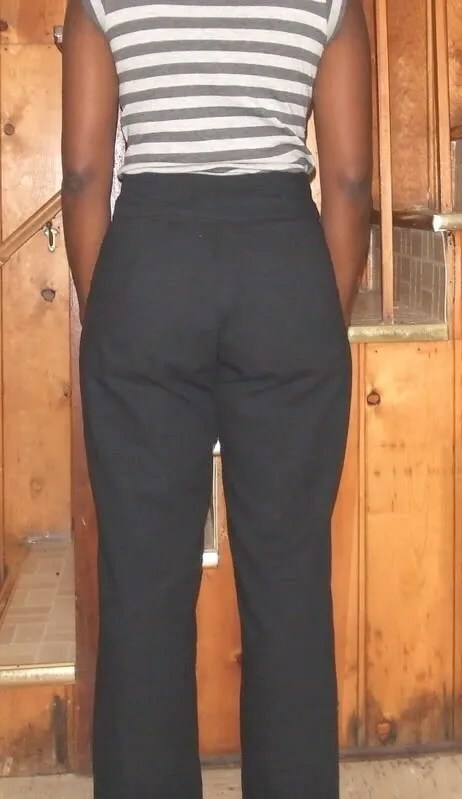 I did make a swayback adjustment to the waistband and like how they are snug against my back. Something unusual for me. Other than that, they fit me out of the envelope. Ok, I probably could do some sort of seat adjustment because they look like they are struggling with ease up and under my rear. I couldn’t find my directions (well, I found them the morning when I was ALL DONE) so I used my Sewing Pants from the Singer Reference Library to make the cuffs. The cuff on these pants are really deep. In fact, I took several inches off the length and reduced the depth of the cuffs. The cuffs are huge again because they were dragging and getting dirty. I still need to tweak the cuffs so that they are even. 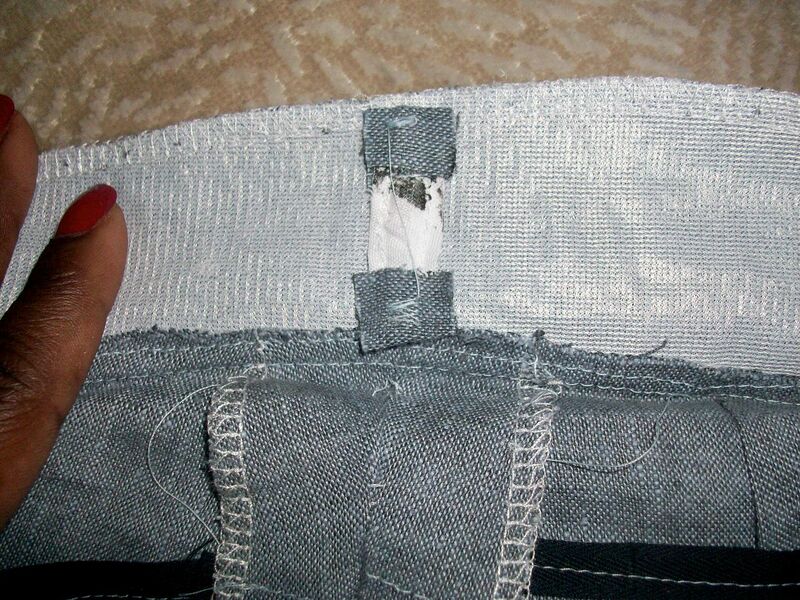 Oh, I also tacked them in the seams, the front and the back. I made belt loops, but I think I’m going to remove them. I don’t have a skinny belt. Well, I do, but I can never seem to find it when I need it i.e. now. I’ve gotten a lot of wear out of these and will probably make my next pants up in the same style. They are totally working for me. These pants conclude the parade of finished projects for the week. Hopefully some sewing over Thanksgiving. Maybe another skirt project and the start of pants or a shirt. Here I am in the BWOF 5-2007-112 pants. They are made up from black on black seersucker. The lining is a pink poly/cotton batiste from Joann. They are really high waisted! Easily to my bellybutton. I did make the buttonhole in pink to try and infuse some interest in the pants. I made a 1.5 inch full seat adjustment just to get the pant over my rear an in the vicinity of my waist. I went down to a 36 in the waist and up to a 42 through the leg. I, um, don’t think my rear is quite that pooky. I think there is some extra fabric there. I did add 1.5 inch to the crotch point in the back. But, I think next time I will leave that off. They seem to have a little too much fabric under my bum. I wore the outfit out tonight for my friend Sheryl’s birthday happy hour. I have to say. These pants are so underwhelming. 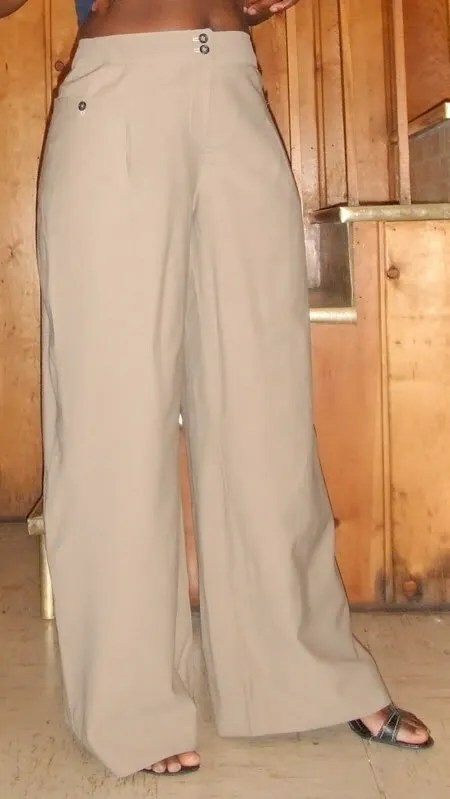 But, it’s fabulous to have a pair of pants that stay up at the waist and aren’t straining across my backside. I think with some tweaks these could become a good basic pattern. I really love the slope / flair. 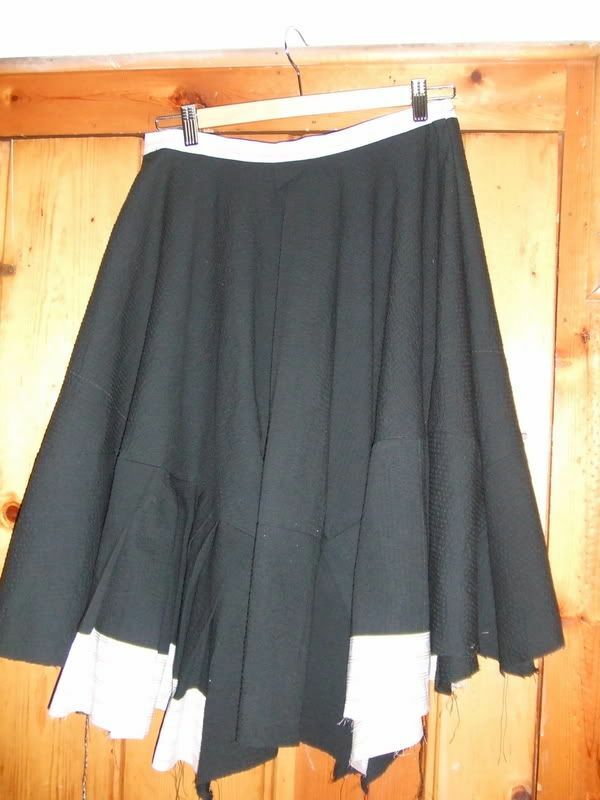 Today, I pretty much got the first of the three skirts done. Since it’s mainly bias cut, it’s hanging now so the bias can drop. I’m planning on tackling the hem on Sunday or Monday. 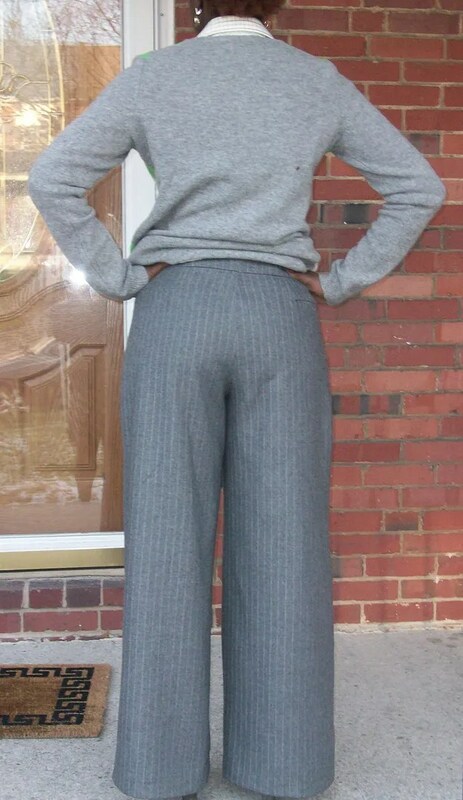 I got an hour today to finish up the 9-2007-115 pants from BWOF. I’m really digging the higher waist looks. 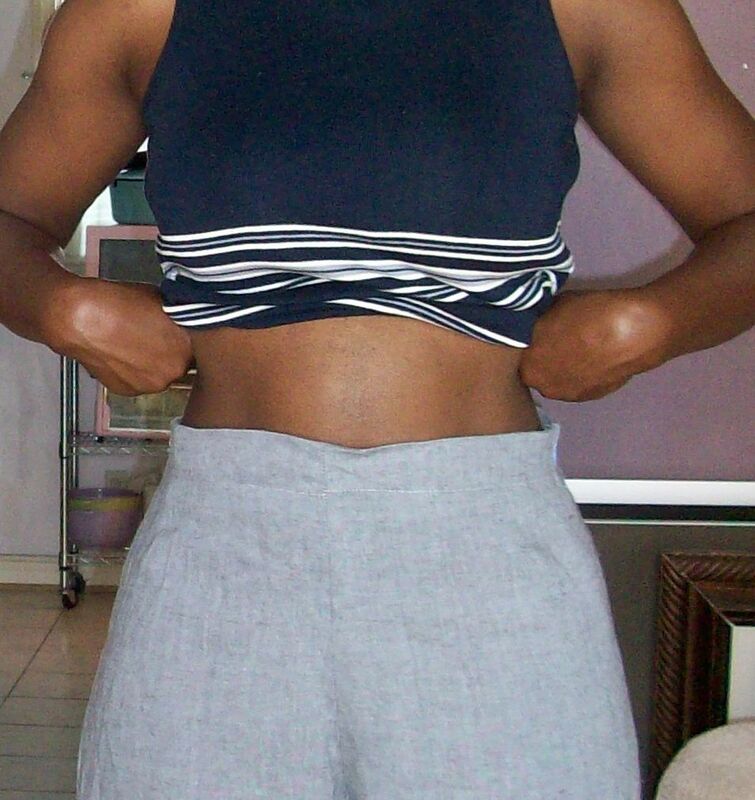 Especially since I think I’ve reached the age where it’s no longer cool (nor desirable) to show my stomach. I don’t love my fly front and it’s my fault. I didn’t add enough to the fly extension so the zipper head peaks out. 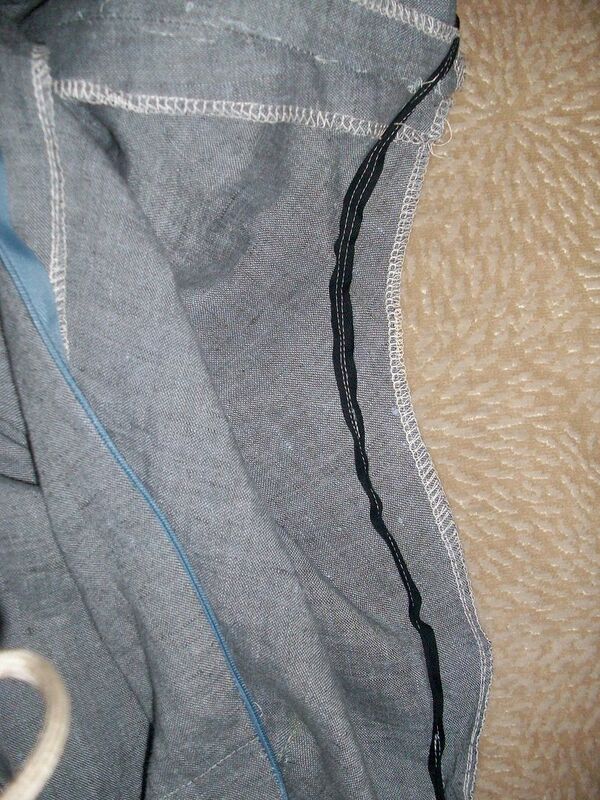 The pants are wonderful, my workmanship is so-so. But, I have fully lined, basic colored pants that I should be able to wear all year. I, in fact, like the pattern enough to make them in another fabric soon. I left off the belt loops. Mostly because I don’t have a belt to wear with these and the pants fit, so belt not needed to keep them up. I did make a seam on the CB waistband so it would be easier to make alterations on the pant for fit. This one needed to come in about 2 inches at the CB to accommodate for my swayback. Not an actual alteration, just a taking in. Since I took them in that much / that high, I should have made about a 1/2 inch protruding seat alteration. I think that would take care of the wrinkles below my bum. I know I don’t sound too positive. But, I really do like these. They just aren’t very well made. That being said, this is about the third pair of pants in my newfound sewing life and maybe the sixth I’ve ever made in 10 years. The fit is pretty good, the style is great, heaven knows I need basics. I just need to practice a little more.